In advance of the workshop, we will try (in conjunction with Research Support Services) to make as much information as possible on the background to Horizon 2020 as possible available here. The intention is for the workshop to be participatory, not simply a general information event on Horizon 2020. Vote on the Multiannual Financial Framework (MFF) in the EP Plenary: September/ October 2013 – all budget figures included below are subject to this vote. What is changing in Horizon 2020? Important novelties include: A single programme for all EU managed research and innovation funding, with a single set of participation rules.Full integration of innovation in the programme, meaning more support that is closer to market application (e.g. demonstration, support for SMEs, innovation services, venture capital).A focus on the major societal challenges Europe and the world face. This will mean bringing together different technologies, sectors, scientific disciplines, social sciences and humanities, and innovation actors to find new solutions to these challenges. Simplified access for participants, including a single web portal for all information and projects, less paper work to make applications, and fewer controls and audits. A more inclusive approach with specific actions to ensure excellent researchers and innovators from all European regions can participate, and reinforced support for partnerships with the private sector and with the public sector in order to pool resources and build more effective programmes. Horizon 2020 is the EU’s funding mechanism which aims to secure the EU’s global position in research, innovation and technology and is designed to create new growth and jobs in Europe and the EU’s replacement for FP7. Complementing Horizon 2020 will be the development of the European Research Area (ERA). Horizon 2020 is the next EU Framework Programme for Research and Innovation which will run from January 2014 to December 2020 with a €70 billion budget. The successor programme to FP7 forms part of the proposals for the next 7-year EU budget, complementing proposals for Structural Funds, education (Erasmus for All), etc. It aims to bring together in a single programme the research and development funding currently provided in FP7, the innovation-related activities of the Competitiveness and Innovation Framework Programme (CIP) and the European Institute of Innovation and Technology (EIT). Horizon 2020 is designed to help bring more good ideas to market and has a strong emphasis on coupling research with innovation. This pillar of the H2020 programme has been set up to ◦Strengthen the EU’s position in science by developing, attracting and retaining research talent. World class science is the foundation future technologies, jobs and wellbeing. This element of the programme will give researchers access to the best infrastructures and boost top level research. H2020 sees a budget increased by 77% over FP7 for the ERC. The aim of this pillar is to strengthen industrial leadership in innovation including major investment in listed key technologies, greater access to capital and support for SMEs. In addition it aims to make Europe a more attractive research and innovation investment option. Leadership in enabling and industrial technologies: will support the development of technologies underpinning innovation across a range of sectors, including ICT and space. 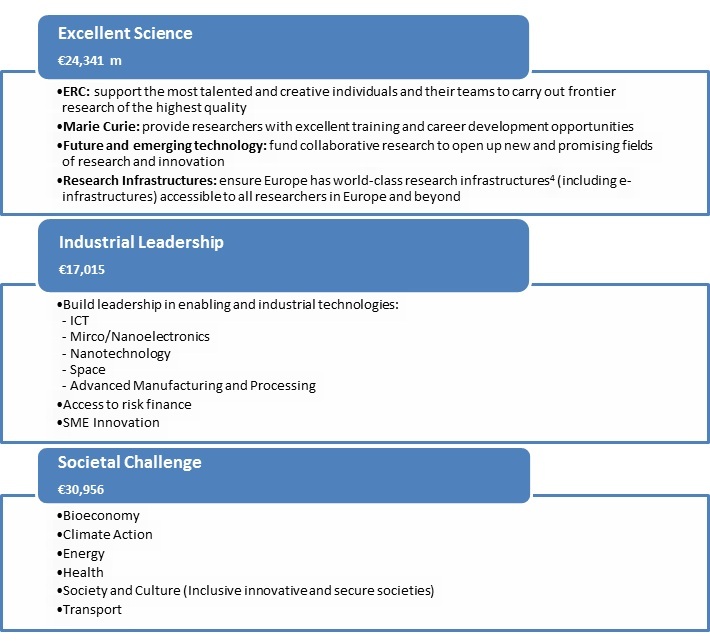 Horizon 2020 will have a strong focus on developing European industrial capabilities in Key Enabling Technologies (KETs) with a budget of € 5894 million in constant 2011 prices. Looking to fund collaborative research and innovation projects with a strong focus on industrial involvement and applied research. Strong bids will looks to combine several key enabling technologies (KETs) for advanced products. For more detail on the KETs please refer to the UKRO presentation and the H2020 EU website. The aim of this part of H202 is to bring together resources and knowledge from different fields, technologies and disciplines, including social sciences and the humanities. This will cover activities from research to market with a new focus on innovation-related activities, such as piloting, demonstration, test-beds, and support for public procurement and market uptake. It will include establishing links with the activities of the European Innovation Partnerships (EIP). The focus will be on inter-disciplinary approaches, and calls will pose questions rather than suggesting answers. • Output-based funding with lump sums for whole projects in specific areas. You can download draft versions of the EC Workprogrammes for each funding stream here. Please note these are for internal University reading only as they have not yet been officially released and may be subject to change on final publication. The above pages are being added to frequently by the EC as the launch of Horizon 2020 approaches.